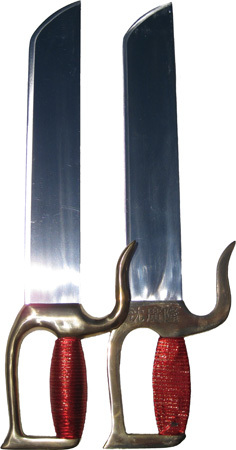 * Wing Tsun teaches only a select few weapons: the long pole and the double butterfly knives. * They are characterized primarily by the artful – but not impractical – shaping of their brass guards and the luminous shine of their polished stainless steel blades (very stiff). Blade are unsharpened. Please Note Vinyl Sheath No Longer Available.